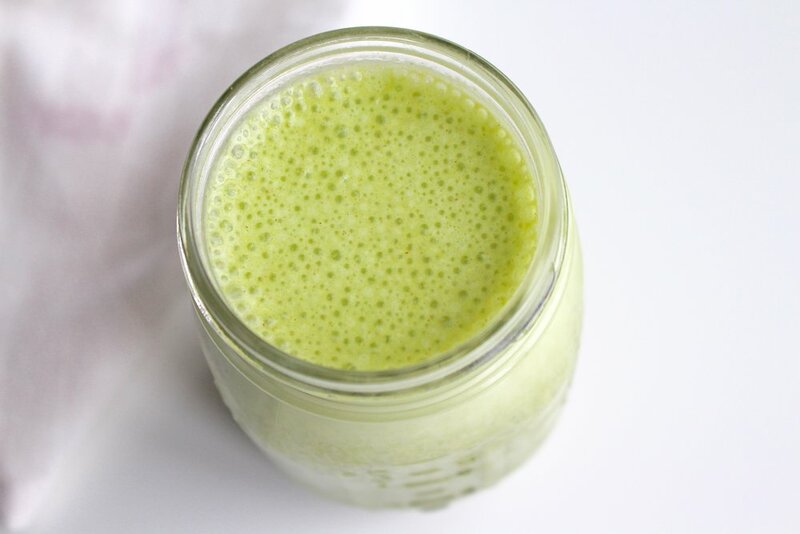 I realized It's been a while since I've shared a protein smoothie recipe on the blog, and then I realized it's been a while since I posted my daily protein smoothie recipe! I will say, I was always just a protein + water in a shaker bottle kind of gal. I love the idea of getting in 20+ grams of protein in a single, tasty drink, but I also love eating real food along with it. Well, as a busy college student on a budget, I know that having a full meal is not always the most convenient way to get in both protein and essential nutrients. So in order to have the best of both worlds, I gave in and started experimenting with juicing greens, adding protein supplements, and even powerful adaptogens. Before I get too far into the recipe, I do want to address the whole juicing vs. not juicing/smoothie diet debate. My take: Find what works for your body, find what works for your lifestyle, and do just that; shocking advice from me, I know! By no means do I juice all of my greens because I love having a big salad on most afternoons. But yes, I also love throwing in a handful of spinach if I know I have a busy day ahead of me and that salad might not happen. It just depends on the day, my mood, and knowing there's no harm in some extra nutrients! I will normally have this smoothie in the morning or early afternoon, again just depending on my life and what's going on. I have found these 6 ingredients work best with my stomach and always keep me feeling energized and full throughout the morning. Maca root is considered an adaptogen, therefore it reacts to everyone's bodies differently. If you're looking to incorporate adaptogens into your diet, I would suggest to start small, slow, and see how your body responds or reacts. If say maca root doesn't work best for you or your body, by no means should you continue consumption. There are plenty of superfoods out there that might work better for you! I love having a protein shake in the morning after a long run or even if I just am feeling something sweet. I've said it before and I'll say it again, my sweet tooth is everlasting and this is one way I cope with it! This shake is delicious, nutritious, and will keep you feeling your best all morning or afternoon. If the recipe seems too basic, feel free to add anything you want! I sometimes add a bit of peanut butter for some extra healthy fats. However, if you're looking for or even just wondering how to put together a healthy shake to begin with, this recipe is perfect for you! I will cover all of the basics, as well as what they do for you and why you should be eating (drinking) them. Start by putting your spinach and frozen banana into the blender, then add 8 oz. of water or milk of choice. Next, add in your protein, collagen, flax meal, maca root, and any other dry ingredients you might want! Blend on high for 30-45 seconds or until your frozen banana is completely blended. Water or Almond Milk - Liquids are pretty essential for any protein shake or smoothie, and the type you choose it totally based off of your preferences. I generally use water for this shake, but if I need a bit more fuel, I'll opt for 1% milk or even almond milk. Just note that unlike milk, almond milk is lacking nutrients and protein, therefore using a protein powder is important for making up those proteins. Frozen Banana - Frozen bananas are a staple in most of my shakes. Any type of frozen fruits or even vegetables, will give your shake that frothy/thick consistency that replicates a milkshake so well. I love how the banana adds a subtle sweetness, without being too over powering in any smoothie recipe. Bananas are also a great source of carbohydrates to give you some quick energy or replenish those muscles! Protein Powder - Whether you like whey, soy, or even pea protein; protein powder is a great way to boost your overall protein intake and keep you feeling fuller, longer! Protein powder in shakes or smoothies is great for pre/post-workout nutrition, but it's also a convenient way to make sure you're getting enough protein in throughout your busy day. Collagen Peptides - This has been getting a lot of attention lately, and for good reason! Collagen is a natural protein that our bodies use for our bones, joints, tendons, hair, skin, and nails. It's also crucial for our digestive systems (hello leaky gut!) and can unfortunately decrease over time as we age. Though our bodies naturally make this protein, it's very beneficial to also consume it through foods or supplements such as this collegan peptides powder. It is completely tasteless and odorless so you can virtually add this powder to just about anything! I even often add it straight into my coffee! Flaxseed Meal - Flaxseeds are a great source of both fiber and healthy fats. However, unless you can/want to physically crush flaxseeds, your body has a really hard time breaking down their shell, and actually using their nutrients. Flaxseed meal is simply ground flaxseed and it perfect for smoothies and recipes! It has a subtle nutty flavor and adds a ton of extra fiber to your shake! Maca Root Powder - Another ingredient that has been getting a lot of attention lately, maca root powder! Maca root is an adaptogen, meaning it 'adapts' to your bodies needs. It's known for giving you a boost of energy and stamina to keep you going throughout the day, as well as helping you relax after a busy and stressful day. Maca root has been used for thousands of years as a healing agent and is still used today for many of the same reasons. It can also help with balancing hormones, libido, and increased memory. This superfood is great to add to any shake and one of my all time favorites! I hope you are able to get some ideas or insight on a great, updated smoothie option to add into your daily routine! I love cautiously playing with different supplements and adaptogens for both the flavor and health benefits. As I mentioned before, adaptogens react differently with everyone, so always start slow and listen to your body. Even if adaptogens aren't your things, this recipe is a really awesome staple to construct a super smoothie that best first your lifestyle!